As a place to live, Sequim has always been tough to beat. Nestled between the mountains and the sea on the northern Olympic Peninsula of Washington State, its boosters call it “sunny Sequim” because quirks of climate and terrain make the place almost as dry as Los Angeles. It’s a welcoming spot for lavender, which grows thick in the summer and draws thousands of tourists to the area. But while most of town’s 7,460 residents love living there, working in Sequim—or, more precisely, working for the city itself—was a whole other matter when Charlie Bush arrived in 2015. Bush’s predecessor as city manager had introduced a sense of consistency and order, but several others who had previously held the post had come and gone in rapid succession, and memories of the instability were still fresh. The office felt hidebound and hierarchical, and many of Sequim’s 80 or so municipal employees lacked a strong sense of purpose in their work. Bush made it a priority to build up morale, and, because many older employers were retiring, he hired new people with less of a command-and-control mindset. Bush began to work with a program at the University of Virginia to put in place a “high-performance organization” model that would stress teamwork, flexibility and leadership at all levels, across all departments. What he still needed, though, was a program with tactical tools to bring to life the framework he envisioned. In April 2017, he found it: the Drucker Playbook for the Public Sector. Bush first heard of the Drucker Playbook when he and a few colleagues were in Oklahoma to attend a conference hosted by the Alliance for Innovation, a nonprofit dedicated to transforming local government. One of the presenters was Lawrence Greenspun, director of public sector engagement for the Drucker Institute and the Playbook’s creator. The Playbook had first taken shape a few years earlier in South Bend, Ind., a Rust Belt city that (under the leadership of a now-famous mayor, presidential hopeful Pete Buttigieg) was experiencing a revitalization after hard times. Greenspun found the dynamism inspiring, and he also saw an opportunity to advance the aims of the Drucker Institute. The portion of Drucker Playbook participants who indicate that the program had increased their effectiveness more than a year after completing it. After consulting with Buttigieg, Greenspun spent a year working with everyone at South Bend’s Department of Community Investment—from its top officials to its front-line staff—to develop a mission statement, surface core values and refine management systems and performance measures. Along the way, Greenspun turned the process into a formal curriculum—all of it geared toward strengthening organizational effectiveness and grounded in Peter Drucker’s core teachings. The combination of Drucker wisdom and practical problem-solving was, for many, a revelation. “I’ve been to hundreds of these things, and I’ll tell you . . . I learned things today that I’d never learned before,” Mark Funkhouser, publisher of Governing magazine and former mayor of Kansas City, Mo., said after attending a Playbook session in South Bend. Since that initial implementation, the Playbook has been deployed in a dozen other locations, including Boulder, Colo.; Gahanna, Ohio; Hennepin County, Minn.; Louisville, Ky.; Memphis, Tenn.; and a number of California cities—Long Beach, Ontario, Perris, Pomona, Rancho Cucamonga and Riverside. In the months following the conference in Oklahoma, Bush and Greenspun made a plan to work together in a way that would go beyond the online lessons offered in the Drucker Playbook. Rather than just purchase the 15 hours of course materials, Sequim would bring in Greenspun to lead several training sessions in person. Also, in a first for the Playbook, every single city employee—from top administrators to maintenance workers—would work through the materials. Last April, Greenspun spent a few days in Sequim and delivered half-day workshops to two of the city’s departments: finance and public works. The aim of these sessions was to focus on values and mission, with each department ultimately charged with crafting its own mission statement. In order to spread the Playbook to other departments without Greenspun’s on-site help, Sequim sent observers who would learn from him and take over his facilitator and teacher role in future sessions. These observers consisted of about a dozen city employees from various offices who had volunteered to receive additional training in management and instruction. Known as the GREASE team (for Great Resource Enabling Actions and Solutions for Everyone), they would disseminate their newfound knowledge among the city’s entire workforce. Among the GREASE team members were Sue Hagener, director of administrative services, and her colleague Connie Anderson, deputy director of administrative services. Both were learning from Greenspun, but, as members of the city’s finance department, they were also working on defining the values and mission of their own team. At times, the discussions grew tense. One group that Hagener worked with wanted “a positive attitude” to be a value. But when someone phrased it differently—“we don’t want curmudgeons”—it became clear that there was an edge to the conversation. “The temperature in the room when you’re talking about values is a really great indicator of where you might need to do some work,” Hagener says. 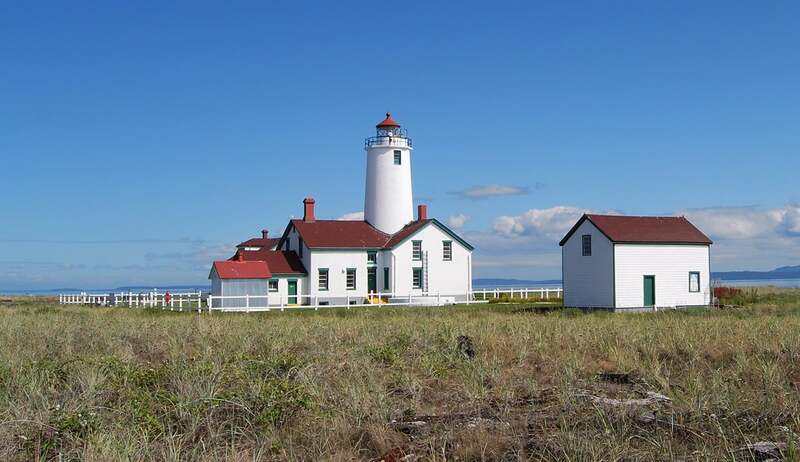 The New Dungeness Lighthouse is a landmark in Sequim, Wash., where municipal employees have used the Drucker Playbook for the Public Sector to hone their mission and measure their performance in meeting it. After the sessions were completed, every department had a mission statement. For public works, it was to “build community by maintaining and enhancing the city’s infrastructure.” For finance, it was “provide the foundation for the city’s fiscal health.” For the office of the city manager, it was to “create exceptional public value.” And so forth. The next step was to take these mission statements and think about how to translate them into measures of effectiveness. This gets to what Peter Drucker considered to be at the heart of good management: setting a goal and measuring results against it. To get the task of determining metrics off to a good start, Greenspun returned to Sequim in November 2018 and led two more half-day workshops. These were attended by the entire city government, as well as visitors from other jurisdictions. In order to meet Drucker’s criteria of clarity and simplicity in establishing metrics, Sequim employees looked first for what was already being measured. That turned out to be a lot. Bush himself was receiving an annual performance evaluation from the city. Maintenance workers were keeping track of repairs. The finance department was generating detailed ledgers and other records. The upshot: While new metrics were necessary in some cases, for the most part a redeployment of existing data was enough. “We knew that our organization was measuring many things that we were already doing,” explains Charisse Deschenes, Sequim’s assistant city manager. “The challenge was to bring it together” in a more focused way to provide greater insight. Picking the metrics that mattered had to be a collaborative exercise. As Drucker warned, “no one likes to be reinvented by fiat from above,” and KPIs, or “key performance indicators,” can become crude instruments of unfairness and overwork. What should be the metrics? Eventually, Priest’s team decided to chart a reduction in nuisances and expansion of capabilities. Now, Priest keeps a strict record of occurrences of problems like backups and leaks so that their number and severity can be compared from year to year. The department tracks each repair and the amount of materials used, to see if patterns emerge. All of this allows for continuous improvement in the city sewer system and a more economical use of resources, making for a happier community overall. “I think a lot of people should be doing something like this,” Priest says. Beyond that, Southard says, just being in a room with officials from other departments helped to create new bonds. And when the police find themselves dealing with impassable roads because of construction problems, cultivating a connection to public works can be helpful. “Having rapport is a huge thing,” Southard says. Or, to put it another way, a city that’s great to live in is fast becoming a city that’s also great to work for. Assess your team’s performance in terms of cost, quality and other key indicators—and for each set an annual improvement goal. Compare your team’s performance against those of others in your organization, with the best becoming the standard to be met for the year—another practice Drucker suggested in his Atlantic piece. For more examples of executives who've managed with courage, click here to read other issues. Click here to read back issues of our previous digital magazine, MONDAY*.